This classic style features round woven, nylon material, which proves to be comfortable when worn around the neck. 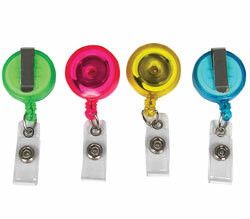 The metal hook securely attaches the ID badge to the lanyard, allowing the badge to be displayed. Durable lanyards allow for the prominent display of badges and ID cards without damaging clothing. Round woven, nylon material with swivel hook attachment. 36 in. long. Black.